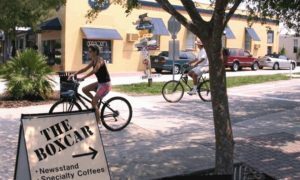 A variety of biking resources, including tools, studies, and documents, are made available through the Forward Pinellas website for the use of local planning practitioners and stakeholders. Pinellas County’s bicycle and pedestrian network consists of over 950 miles of bicycle lanes, shared-use paths/trails and sidewalks and there is a strong commitment to further improve walking and cycling conditions. This long standing commitment is critical to creating environments where bicycling and walking are viable alternatives to automobile travel and through the efforts of local governments and the Florida Department of Transportation, substantial progress has been made toward this goal. The Facilities Element of the Bicycle Pedestrian Master Plan is intended to further these efforts by facilitating the development of an extensive network of bicycle and pedestrian facilities that maximizes opportunities for people to get around the County by foot and bicycle. Through both infrastructure improvements and non-infrastructure programs, Safe Routes to School (SRTS) focuses on advancing safer walking and bicycling to and from schools to improve the health and well-being of children and to foster the creation of livable communities. 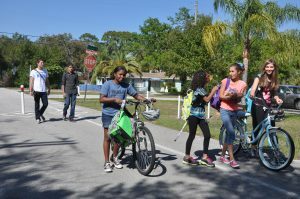 Forward Pinellas supports environmentally sustainable, cost-effective, healthy, and equitable transportation modes by promoting safe walking and bicycling to, from, and around schools in Pinellas County. To learn more about SRTS programs, tools, and news, please visit the Florida Department of Transportation’s SRTS webpage. Measuring bicycle and pedestrian activity on the Pinellas Trail is an important step towards understanding trail use as a active transportation alternative, identifying trends, and finding ways to improve safety and connectivity for people traveling by bike or on foot. In 2016, Forward Pinellas is embarking upon an update of its Trail User Data Collection Project using automated bike/ped counting equipment. The project is being funded through the Partnerships to Improve Community Health with the purpose of increasing the data available to make informed decisions about future bicycle and pedestrian transportation investments. 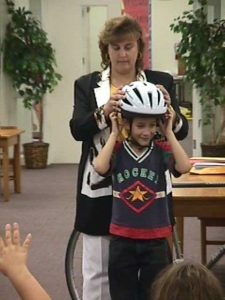 Forward Pinellas takes part in cooperative efforts and programs to raise awareness of bicycle safety. We regularly engage in public workshops and meetings of professional, civic, and social groups, and distribute safety information via brochures, newspaper articles, press releases, and social media posts. Hard-shell helmets are required for riders under 16. It should cover your forehead and the back of your head and fit snug. Center the buckle under your chin; you should be able to fit only one or two fingers between it and your chin. How big, how high? When you stand astride a bike, there should be just an inch or two of clearance between you and the bike—more for mountain bikes. Adjust the seat so your extended leg is almost straight when sitting and pedaling. Tires, brakes and chain. Maximize your effort: know what pressure your tires should be; check before riding. To check brakes, squeeze them while rocking the bike onto the front tire and then the back. If all is well, the tires won’t move. Grit is a chain’s enemy. Keep it wiped clean and lubricated, especially after gritty, wet rides. Stay dry with fenders, a rain jacket and pants or rain cape, and waterproof shoes. Slow down on wet roads, especially after the first rain after a dry spell. Brake early and often, allowing plenty of distance to stop. Avoid painted and steel road surfaces, leaves that can become slick when wet. Even though it’s tempting, riding through puddles should be avoided, as they can disguise deep potholes or other hazards. Locks and thieves. Lock your bike to a secure object in a well-lit, well-traveled area. Cable locks are easy to cut; use a U-lock or heavy-gauge chain. Know the Law. Forward Pinellas provides information on state laws pertaining to cyclists. Below you will find links to various bicycle resources.